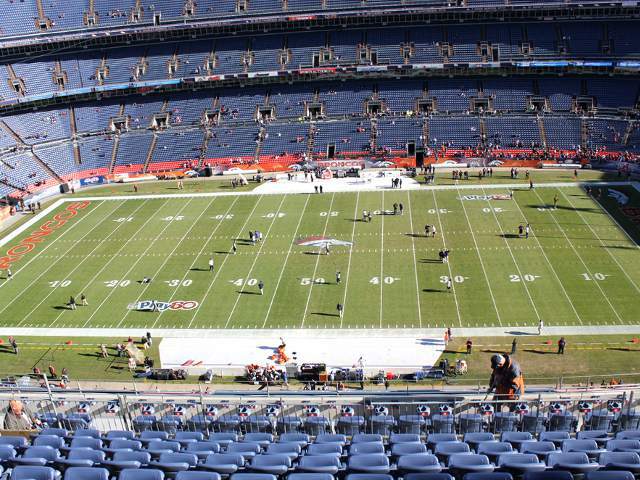 The Denver Broncos Upper Level Sidelines describes the best seats on the top level of Sports Authority Field at Mile High. The Sports Authority Field at Mile High seating chart shows the Broncos Upper Level Sidelines near the 50-yard line on both sides of the field. Denver Broncos Upper Level Sidelines 14 total sections split into 7 sections on each side of the field. On the home (west) sideline are section 505, section 506, section 507, section 508, section 509, section 510, and section 511. On the visitor’s (east) sideline are section 531, section 532, section 533, section 534, section 535, section 536, and section 537. All Broncos Upper Level Sidelines seats provide a great view of the field due to their height and angle to the ground. The best seats, in the front rows of each section, offer a view that is comparable to that provided by the much more expensive United Club seats one level below. Broncos Upper Level Sidelines tickets are sold largely to long-time season ticket holders who purchase a full season ticket package of two preseason games and eight regular season games. The current price of Denver Broncos tickets changes each season, but Upper Level Sidelines tickets are always cheaper than any seats on levels closer to the field and more expensive than any other seating areas on the upper level. The best value for Upper Level Sidelines tickets comes in purchasing front row of any section or tickets for section 508 and section 534 closest to the 50-yard line. Some fans may also want to consider the different views offered by sitting above the home (west) sideline as opposed to the visitor’s (east) sideline.